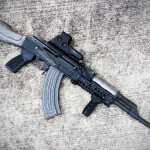 We were testing lately AK 47 / AK 74 Rail System – X47 from Tdi Arms. Israelis did really good job when designing it. X47 is battlefield proven system, combat tested by IDF and many Russian Spetsnaz operators…It is worth to note, that this system could be installed without top rail, when mixing with standard gas tube hand guard and etc. By far, it is one of the most flexible rail sets on the market. TDi Arms X47 fits on majority of milled and stamped receivers, without any modifications…Below is our “first take” video review. You can get these rails from Circle10AK. If you would like to help us to make even better videos, we are accepting donations now. Our next goal is new lens for our camera! 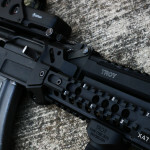 Troy Industries with their AK47 rail system brings wave of fresh air into the AK world. Their rail design clearly separates Troy from the crowded “AK Rails” market. However, more conservative AK users will probably find this design way too extreme. Personally I like it a lot, because their rail offers fantastic ergonomics and it really helps to better control rifle. At this point Troy makes 2 different lower parts (short and long) and has 1 extra railed gas tube part as well. All these are independent from each other and you don’t need top part to use lower part and vice versa. Now, when lower part is rock solid, we did encounter some problems with railed gas tube replacement. Mounting for it is based on small size castle nut and we had a hard time to keep that nut from untwisting. I’m looking now for dedicated wrench for it (it is different size than traditional castle nuts) and we will go back to this issue again in future episodes. Overall, Troy made a darn solid product and i’m very pleased with it. Please note that this rail will not mount on AKs with 24mm front end! 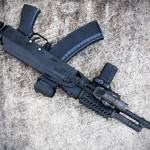 Great news for C39 AK clone owners, TDi Arms X47 rail system works with C39 AKs. Lower portion of the rail fits like a glove. Also, rear optic mounting rail fits on it as well (see pictures). The only problem is with upper rail portion, because Century International Arms is using proprietary gas tube which is slightly shorter than regular ones. Please note too that rear neck on that gas tube is too thick to fit upper portion of X47 (without any mods). 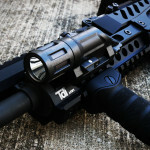 But fear not, with rear optic mount you can have optic mounted there and you can use your regular C39 upper hand guard. However, if the rail over the gas tube is a “must have” for you, then i have found another solution. You can use on C39 Troy Industries railed gas tube! Pictures below. Let me know if you have any questions about these setups. Ps. If you would like to help us to make even better videos, we are accepting donations now. Our next goal is new lens for our camera! “Alpha” prototype of key mod rail system for AK rifles. This is joint project between brilliant Sven from Manticore Arms and AK Operators Union. We have been very busy working on this together with Dima, but finally we can show some fruits of our hard work. This lower rail will work with any standard AK upper hand guard, Ultimak or Troy Industries railed gas tubes. So you will be free to mix and match whatever you want with this rail. Our upper hand guard will be optional. However, the upper hand guard will offer co-witness option when in use with Aimpoint Micro type red dots (that’s going to be done for Beta Prototype). Another piece of this system is mount for optics placed behind the rear sight. This rear rail sits very low, just slightly above the dust cover (this is going to be separate mount option). Rail will be made from out of military grade aluminium. Price: Unknown at this point, but we will try to keep it as affordable as possible, but without compromising quality. Big thanks to Sven and Manticore Arms – this wouldn’t be possible without him. 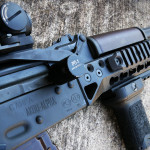 “Alpha” prototype of key mod rail system for AK rifles in pictures below. 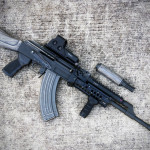 Kalashnikov import ban – AK Operators Union Take on it! Kalashnikov import ban is in place. As of right now imports of Saiga and Vepr rifles and shotguns are banned by executive order issued by President Obama. As “excuse” for this ban, administration used current situation in Ukraine, but let’s be clear about it, this ban has absolutely no impact on Russia. Saigas sales for Russian economy were like a little water drop in the ocean. Their main source of income is from sales of gas and oil. This ban not a coincidence. Senator Feinstein (D – CA) was lamenting for months to Obama to do something about AK sales. She specifically used AK rifles as an example. Here is link to news from March on this. Obama couldn’t ban everything, but to keep Feinstein happy he throw her a “bone”, which is ban on Kalashnikov concern products imports. You can’t make this up…in this video is my take on the current situation. AK Training Class – Range visit! You order training class from here. 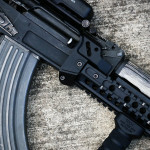 This is Troy Industries AK47 rail (Full length) installation video tutorial. You can get this rail from here. Rail weight (lower module): 10.98oz, Top section: 5.68oz. This hand guard is made out of 6061 T6 aluminium. Coating: MIL-A-8625 TYPE III CLASS 2 HARD COAT ANODIZED w/Teflon. Troy Industries is kind of new to the AK game. Just recently they came up with set of rail for AK rifles. They have 2 different versions for lower part and 1 for top portion of the hand guards. It is worth to note that upper portion is completely independent from the lower part and it is not required. 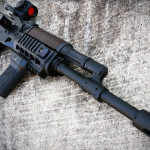 Users can mix and match lower rail system with standard upper wood hand guard (for example). Troy features very modern and ergonomic design. When this may not be visually appealing to everyone, I have to admit that way how this rail handles, truly is amazing. We will run multiple tests on Troy rails to see how well they will perform from durability point of view…this is our first take: Heat Torture Test for Troy AK47 / AK74 Rail System (Short rail). 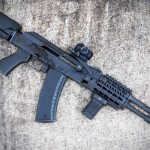 This is our first take on Vepr 12 AK style semi auto shotgun. This “monster” is so much fun to shoot that it is hard to describe. Top quality (Molot really did an excellent job), reliable and it delivered fantastic performance. This is clearly my favorite shotgun now, and yes, i have used Benellis and Berettas too… We got that one from Atlantic Firearms. They have it now for $799 which honestly i think it is a great deal. Here is our first take on that “beast”.